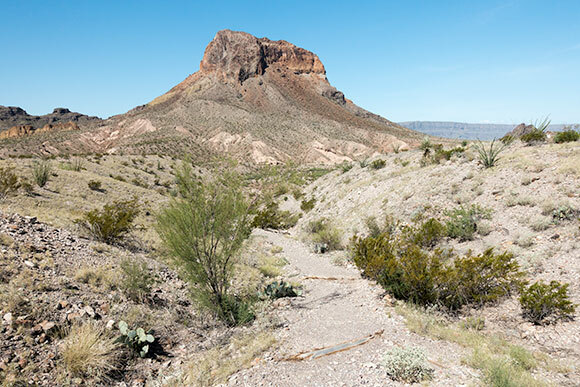 Tuff Canyon (not to be confused with tough) in Big Bend National Park is an easy day hike down into the bottom of a canyon consisting primarily of a soft rock made out of volcanic tuff (volcanic ash). 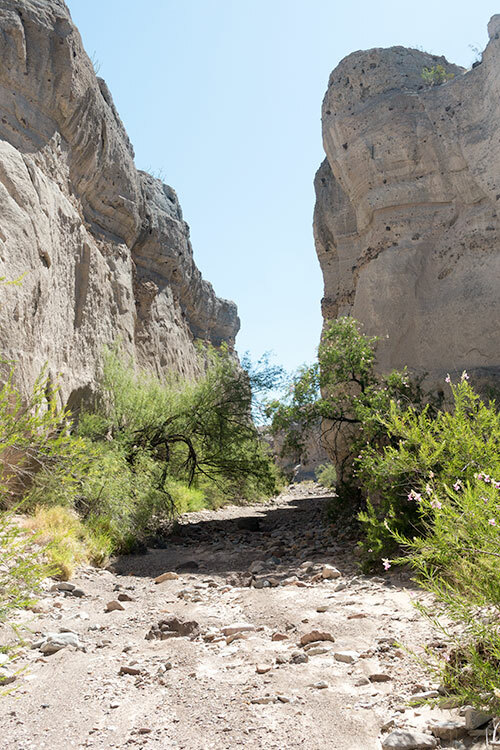 This canyon has been carved by thousands of years of rainfall, falling high in the Chisos Mountains to the Northeast, then flowing through Blue Creek, then all the way down to the Rio Grande to the Southwest. This area is prone to flash flooding, so it should be avoided if it looks like it could rain. 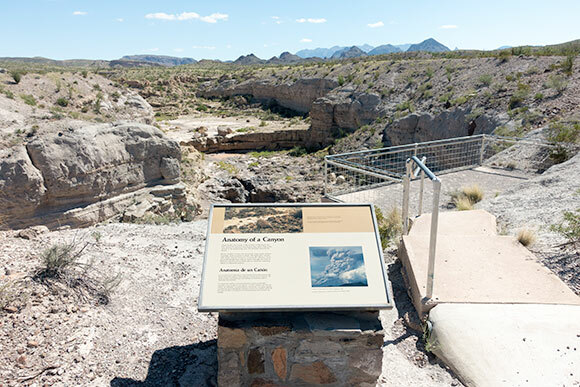 To get to the trailhead for Tuff Canyon Trail (29.149543, -103.487091), take a left out of Park Headquarters at Panther Junction and drive approximately 13 miles to take a left hand turn onto Ross Maxwell Scenic Drive to Castolon. From there, you’ll need to drive about 20 miles to a pull-off on your right. You should see a sign indicating the trailhead is coming up before you get there. It’s a little under three miles to Castolon Store if you need to stop for supplies or a bathroom break (just remember there is no gas at Castolon). At the pull-off for Tuff Canyon Trail, you’ll find a couple of small trails leading to the canyon edge where there are railed balconies overlooking the canyon. Be certain, when at these overlooks, that you stay in the railed areas. With the rock here being volcanic tuff, it’s brittle and can easily crumble and break off. You don’t want to end up taking the fast way down into the bottom of the canyon. Also, please don’t throw rocks or debris into the canyon. There could be hikers down below. The trail down into the bottom of the canyon begins on the South side of the roadside pull-off. The trail gently slopes down to the canyon floor into the typically dry Blue Creek. As you start making your way down the trail, the mountain you see in front of you (across Ross Maxwell Scenic Drive) is called Cerro Castellan. Once down near the canyon floor, you’ll hang a right down Blue Creek. 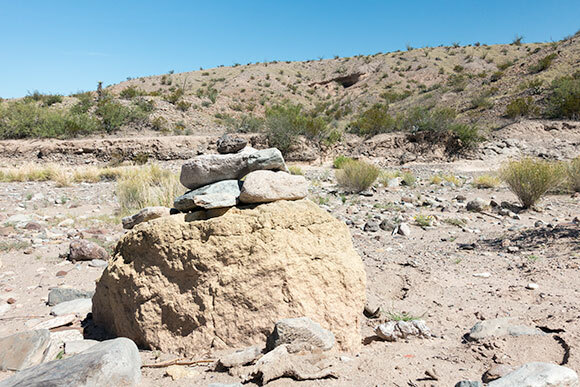 You’ll see a rock cairn marking where the trail enters the wash. It’s pretty easy to see where you’ll take a right when going into the canyon, but the cairn is helpful in identifying where the trail heads back up to the top when coming back out. 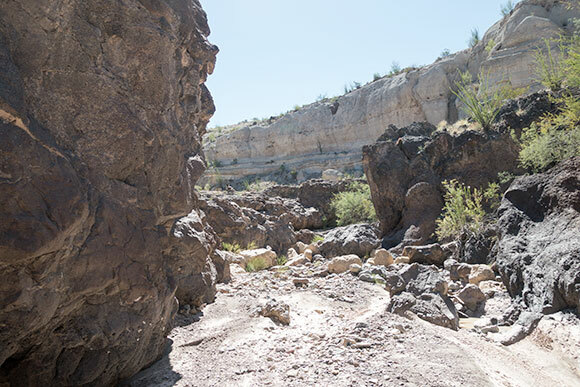 Once in Tuff Canyon, you’ll see evidence of water with the lush greenery. 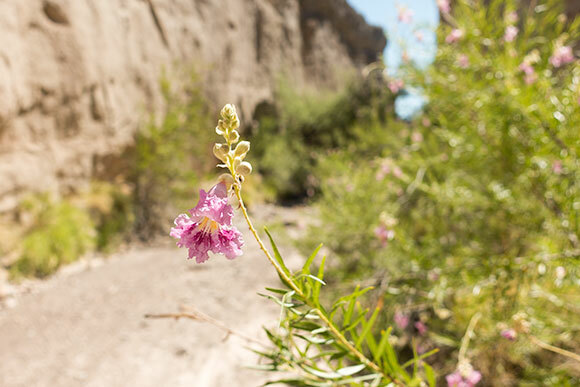 You’ll also have the opportunity to enjoy some rare shade in Big Bend National Park. We were lucky on our trip through Tuff Canyon that it had rained a bit of the past week (Tuff Canyon is prone to flash flooding, stay away if it looks like it’s going to rain while you’re there). 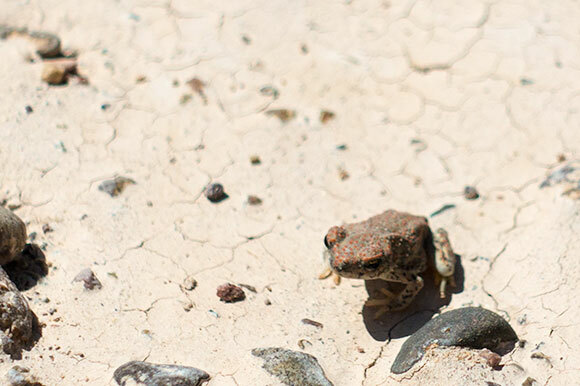 There were tiny Red Spotted Toads (Bufo Punctatus) hopping all over the canyon floor. The Desert Willows (Chilopsis linearis) were also in bloom. Toward the end of the trail you’ll start to notice more rock formed from magma as opposed to volcanic ash, with the very end being a large, impassable formation of it. From here, you’ll make your way back to the beginning of the trail by retracing your steps. Remember to keep an eye out for the rock cairn marking the spot where you exit out of Blue Creek to make your way back up the hill. 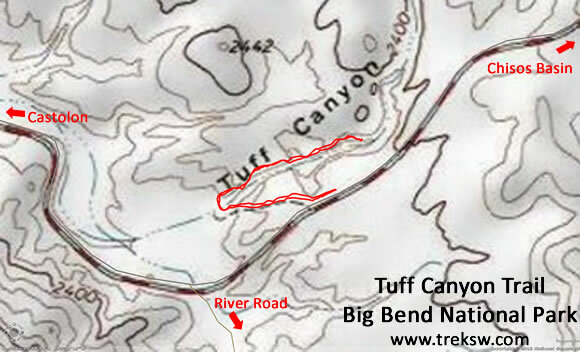 Learn more about Tuff Canyon in “Down to Earth at Tuff Canyon, Big Bend National Park, Texas,” provided by the Texas Bureau of Economic Geology.